Top, a panel discusses the new NewEngland Studios at Devens. The $41 million New England Studios complex opened its doors at Devens at the end of September, the first major movie and film production complex ever built in Massachusetts. An imposing structure, it has the feel and look of a massive, empty aircraft hangar, its walls soaring to rafters more than five stories up. Nearly two months after opening, the cavernous, soundproof facility has yet to book a single show or movie. But the developers of the project, local film industry veteran Chris Byers and local real estate developer Mike Meyers, say they aren’t sweating it. Not by a long shot. Rather, the duo insisted they are preparing for take-off as they showed off their gleaming new studio complex to a group of local and state officials and business people at an event Friday morning. In fact, Byers, marketing director for New England Studios, said he expects the first production to start moving early next year. 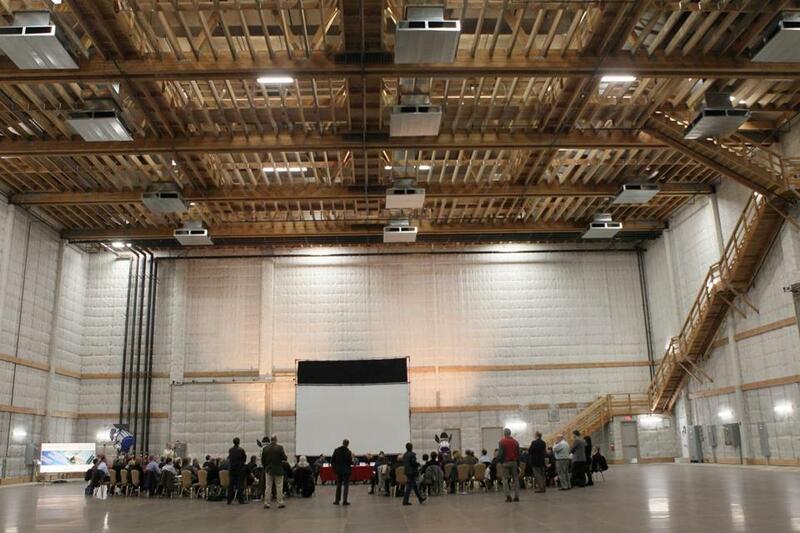 Byers said he is in talks with five or six TV shows and major films interested in renting out one or even all four of the project’s 18,000-square-foot sound stages. While he is getting close, Byers doesn’t expect to have a contract in hand for the first show until mid-December. “It’s all the majors — Sony, Columbia, Fox, and Disney,” he said of the different players he is in discussions with. That may sound very last-minute and maybe even problematic for a new venture. After all, companies often sign deals years in advance to lease office space in a new tower. The same for trade shows announcing plans to hold an event in a major city convention center. “They may not know until three months before the shooting whether the production is real or not,” said Arnow, who was at Friday’s event, taking part in the panel discussion. The studios have all the bells and whistles, including private rooms and baths for the stars, so they don’t have to traipse out in the cold to rented trailers, Meyers noted. There is even a private passageway for the set’s leading men and women. Local businesses are also hoping to cash in. Steve Catalano, owner of Dulce Catering at Devens, is already doing a brisk business feeding the crew on the set of the HBO mini-series “Olive Kitteridge” that has been filming in Boston. He’s anticipating even more business when the Devens studio starts booking big productions. A major movie production could bring 250 people to work every day at the Devens studio complex, with a TV show employing about half that number, film industry veterans estimate. “The consumption is huge by these movies when they go in,” said Catalano, who is a board member of the Nashoba Valley Chamber of Commerce. And it’s not just catering companies who can make some extra bucks. When a major production sweeps into town, it will start spending money on everything and anything, from meals to the cleaners, said Arnow, the veteran producer. One movie he worked on needed $2.5 million worth of lumber, he noted. Local restaurants, gas stations, and rental car agencies could also hit the jackpot, depending on what is needed. However, now is the time for local shops and service providers to get out the word about what they can offer to the right people, before movies and films start coming in, Arnow and others advised. That may mean simply dropping by a brochure or packet about your business at the New England Studios complex, Byers said. He said he is now compiling a list of local service providers to share with productions that rent space at the studio. Also taking this advice to heart were local film industry workers and aspirants, who were eager to get their names in circulation. Sigrid Usen of Wellesley showed up to plug her son, Nick, an aspiring filmmaker now studying at the University of Vermont. “As a mother of a filmmaker, it is nice to have something here in Massachusetts instead of having to go to Los Angeles or New York,” she said. Of course, one could be cynical over all the high hopes. After all, there have been lots of headlines about all the failed attempts over the years to capitalize on the state’s popularity among movie and TV producers and create a so-called Hollywood East. But New England Studios has managed to do something a succession of other developers failed miserably at, including the now infamous Plymouth Rock plan, and that’s financing and building a full-scale movie production complex. Now that they have built it, Byers and Meyers are confident the movie industry will come. In fact, Meyers already plans for a major expansion, with even more studios and a film school as well. So far, supporters of the studio project, including Mass Development, which oversees Devens, the former military base turned economic development magnet, are happy the big project is open and looking forward to seeing it fulfill its potential. George Ramirez, executive vice president of Devens operations, said he sees the potential for another home run for the state authority, comparable with the deal that led to Bristol-Myers Squibb building its big plant at Devens. “It will be the second shot heard around the world from Mass Development,” he said. Reach Scott Van Voorhis at sbvanvoorhis@hotmail.com.